Rabbit Stew: Cooking Rabbit: To soak - or not to soak? I've read a little on forums about soaking skinned rabbits before cooking them, but - up till now - I've never bothered. Some people say soak overnight in salty water and some in water with vinegar - the rationale, either way, seems to be that the soaking has a tenderising effect on the meat and and perhaps also improves the flavour. I thought I'd give it a go with this most recent catch and - though it's difficult to tell if the results are due to the process itself or some other factor - it seems to work very well (and I soaked mine overnight in water with salt and malt vinegar in it!). The meat emerged rather blanched from its soaking and, after cooking - a slow stewing with onions, carrots, celeriac, Dijon mustard, thyme, a couple of prunes and a little honey, I found the meat to be the most tender and flavoursome I think I've ever eaten: it was really superb. As I say, it's hard to know if this is due to the process or perhaps due to this being a young rabbit (though I've absolutely no idea if this was the case - it certainly wasn't any smaller or lighter than rabbits I've had before) - but either way, I do think it's something I'll be doing again in the future. I cooked a rabbit stew a couple of weeks ago with one I'd bought from our local fishmonger - he does a sideline in fresh bunnys. I soaked the sectioned meat for about 30 hours in salted water, then slow cooked a stew, much as you did. 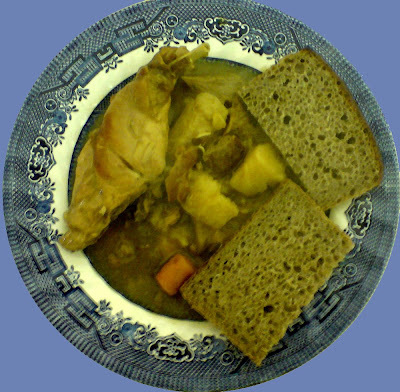 The flavour was absolutely fantastic - better than remember for other rabbit stews. I'm not sure whether it was all down to the soaking but I'll certainly be doing it again next time. Excellent! Thanks, that's very interesting. Thanks very much for the "brining" advice. I've used it often for poultry. The photo of the stew looks great! I don't see the recipe! I'll look back as I bought my first rabbits today! I came across your blog while searching for rabbit info. I bought my first ever rabbit from a butcher at a farmers market, he said soak it in salt water for 2 or 3 hours to get rid of any remaining blood. So i've got mine soaking now. I've enjoyed looking around your blog, it's well written - draws me in even on subjects i'm not familiar with, suddenly i'm now interested in things i never thought i was interested in haha!